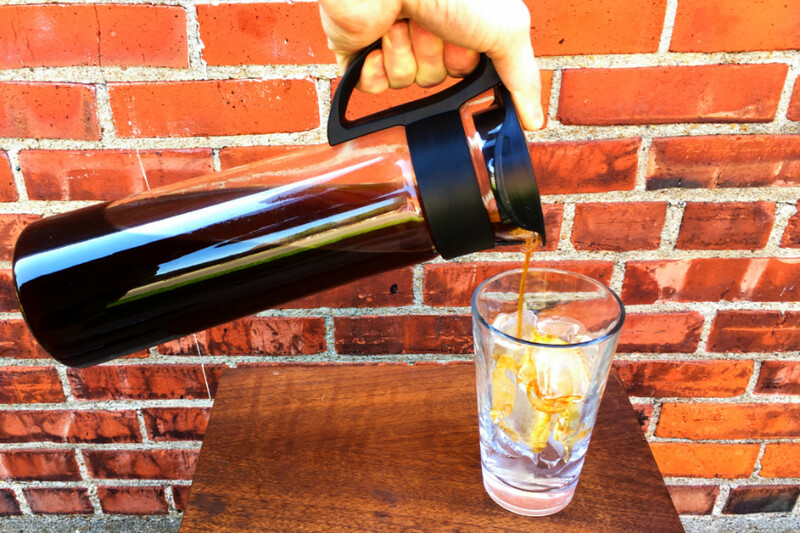 With Kansas City heat still blasting us well into August, cold brew is the go-to afternoon beverage around here. 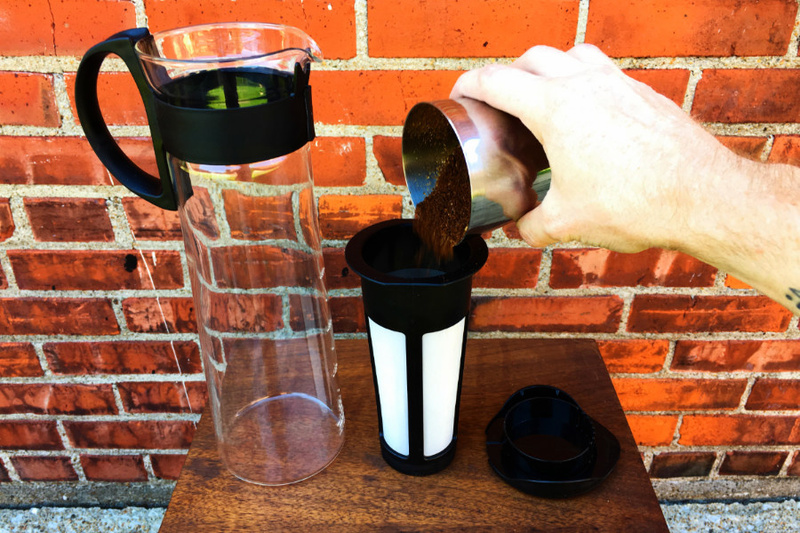 On a whim, I decided to check out a product from Hario -trusted manufacturer of the V60 dripper- that looked promising: the Mizudashi Cold Brew Pot. After trying a few brews, I thought I’d share my findings and thoughts and help people looking for a way to make some great cold brew at home. So, here’s an objective review of the Mizudashi brewer from Hario! 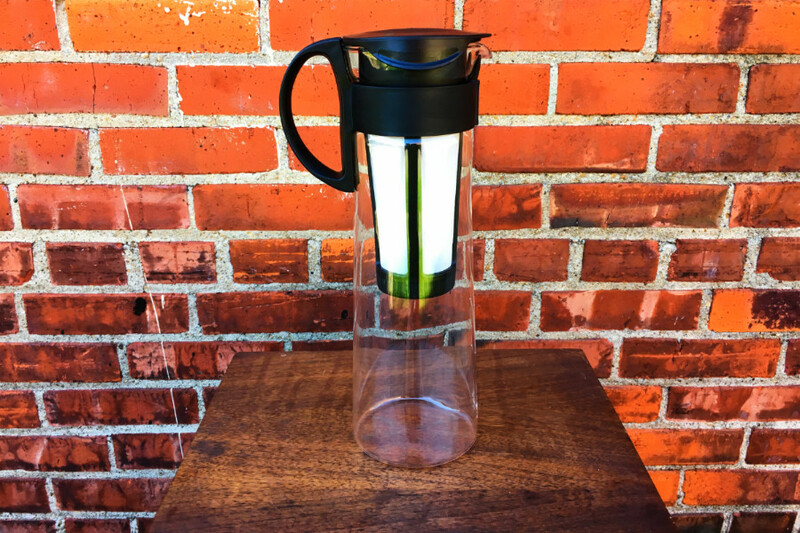 While the Mizudashi seems to be made well enough, the combination of a glass carafe, plastic handle and very fine nylon mesh brewing chamber mean that this item should be handled carefully and probably hand-washed. 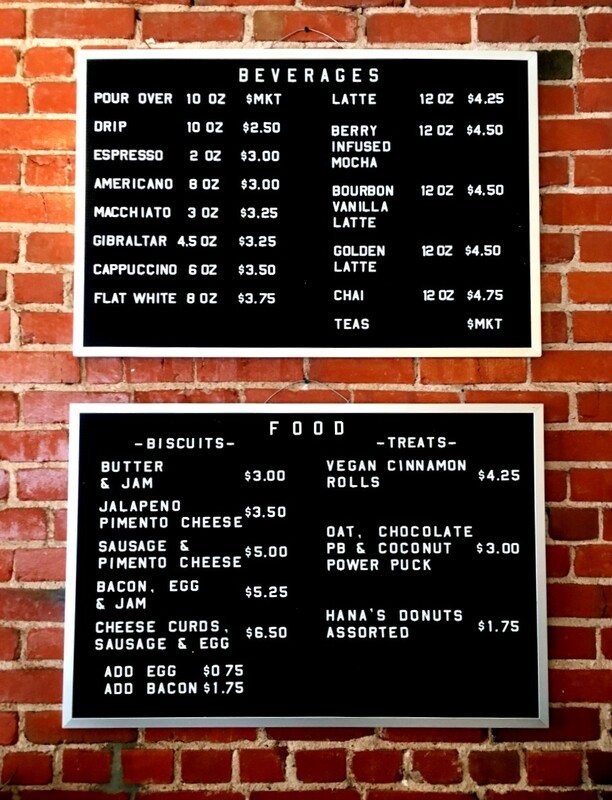 I’m sure the choice of materials helps keep the cost as low as it is to make the brewer accessible to lots of people wanting to dip their toes in the cold-brew pool… so to speak. Just take care while cleaning and transporting and you should be fine! This is where the Mizudashi really shines. It couldn’t be easier to make great-tasting cold brew. You just grind your coffee, add it to the brew chamber, and slowly fill the carafe with water until the coffee is submerged. When it’s done brewing, you pull the chamber out, dump the grounds and throw the carafe in the fridge. Done. Hario recommends using 80 grams of medium-fine ground coffee for a full 1000mL pot and brewing in the fridge for 8 hours. 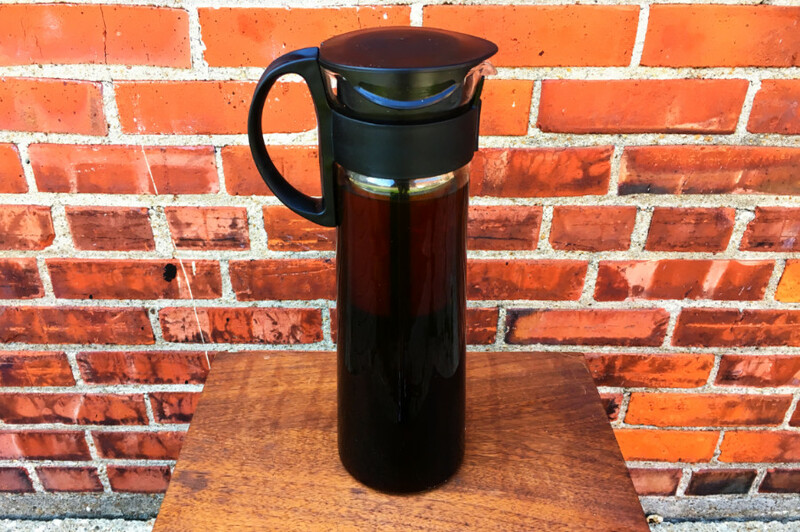 I found this didn’t produce the flavor profile OR brew strength I look for in great cold brew, so I did some experimentation and found a recipe that makes a strong, sweet and complex batch of cold brew that is not only refreshing but invigorating! Here’s my method, outlined below. Start with 110 grams of medium-coarse ground coffee. If you can’t get exactly this grind size, don’t panic. You can adjust your brew time to compensate; a finer grind will need less time to brew, and a coarser grind will need more time. Slowly pour cool, filtered water over grounds. 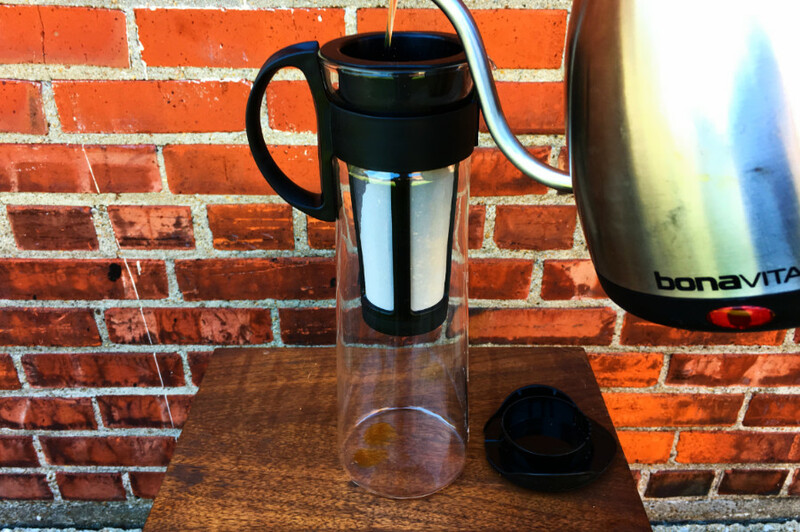 As mentioned in our post about making better coffee at home, using filtered water will give you a much cleaner-tasting cold brew. If you have a kettle for brewing pour-overs, that’s useful for adding water at a nice measured pace. If not, just do your best to add water slowly. 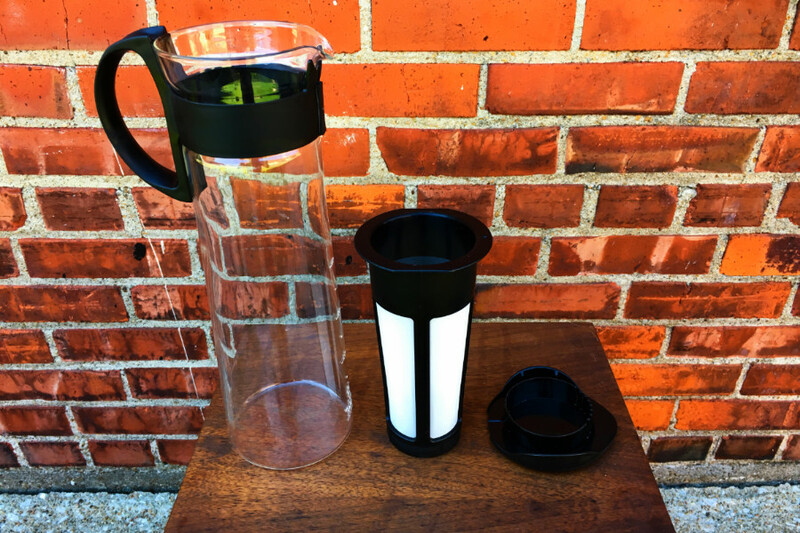 The water will filter down through the coffee and drip into the carafe. If you’re short on time, pour directly into the spout to fill the carafe. Just keep adding until the water level reaches the top “band” where the handle attaches to the carafe. Then put the lid on the carafe. Give the carafe a gentle shake. This will help make sure all the ground are saturated with water and give an even extraction. You can also do this again half-way through the brew as an added insurance for a strong brew and even extraction. Let sit at room temperature for 18 – 24 hours. I know we’re technically talking about cold brew here, but the just-above-freezing temps in the fridge tend to produce a sludgy-tasting cold brew in my opinion. 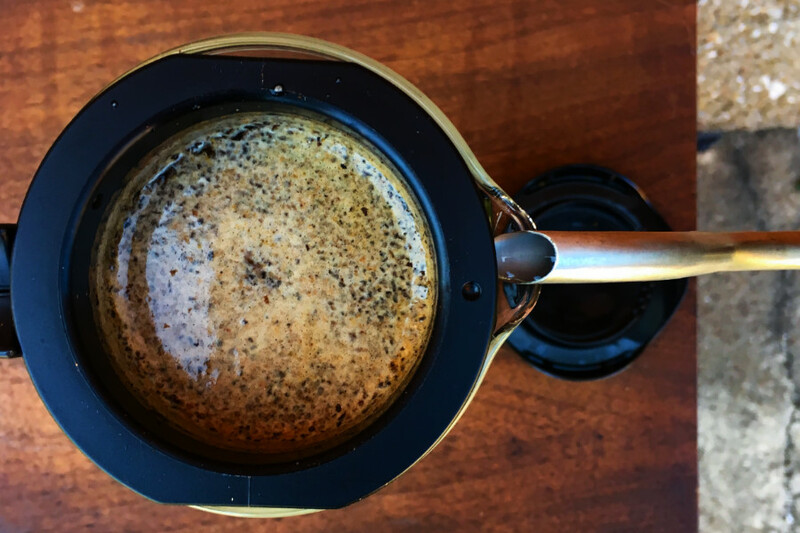 As long as your house/office/secret lair isn’t consistently above 75 degrees F, you’ll get a much more lively and vibrant-tasting brew at room temperature. And besides, compared to the 205 degrees needed for a good hot extraction, 75 is pretty cold! 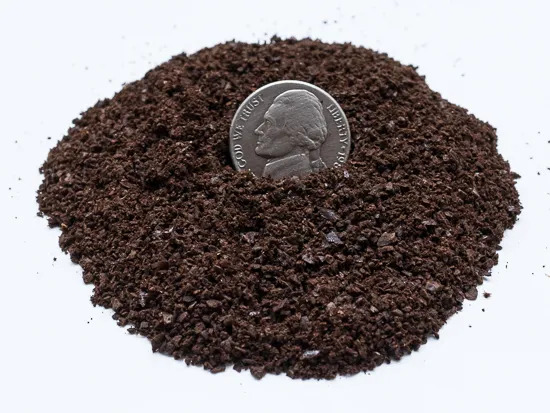 Depending on your grind size and taste preference, the brew can go anywhere from 18 to 24 hours. 20 hours was the sweet spot for me, so I started a brew at noon on a Friday, and it was ready to go for breakfast Saturday morning. Remove the brew chamber and clean. Once you’ve reached your desired brew strength, all you need to do is pull out the brewing chamber, lid the carafe, and throw it in the fridge or you can serve over ice right away. I recommend cleaning and rinsing the brewing chamber with hot water right away. This will keep it clean longer and free of old coffee residue. Remove the bottom of the chamber for easy rinsing. If the nylon mesh starts to become discolored or has an old coffee odor, you can soak it in a warm solution of Urnex Cleancaf to renew it. Your brew should be strong enough to serve right away over ice, or throw it in the fridge for a bit and you can drink the stuff straight but watch out! 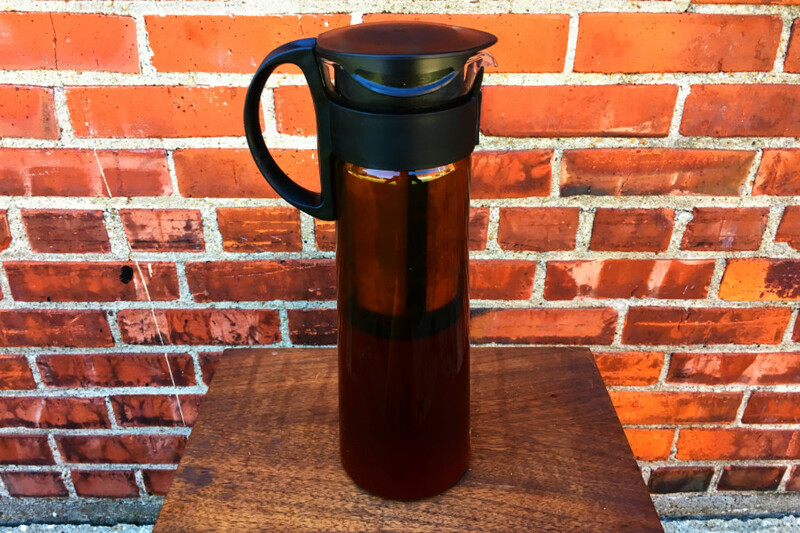 This cold brew may be super refreshing and drinkable -especially if you use a delicious and clean washed coffee from Oddly Correct– but it is strong and will have you buzzing well into the afternoon if you pound glass after glass of the stuff. You can store it in the fridge in the provided carafe for about two days before the coffee starts to oxidize, or transfer to an airtight container in the fridge to prolong its life. Keep in mind this recipe is a starting point and brews a beverage for my personal preference; a strong but bright and vibrant iced coffee beverage. You can make tweaks to fit your taste preference, or even dose up and grind fine to make a super-strong concentrate, OR get crazy and make a batch with a fine distilled spirit like Mean Mule Blue Agave to produce an insanely delicious coffee liquor! All in all, I think the Mizudashi is capable of producing really great-tasting cold brew with minimal hassle, mess and investment. While durability could be an issue, careful handling and washing should give you many batches of crisp refreshing goodness for any time of the year.